For 2013 Pantone have officially named Emerald Green (code 17-5641 – or DULUX TRADE 02GG 21/542) as their ‘Colour of the Year’. Described as, “Lively. Radiant. Lush.” this sophisticated colour brings the same elegant feeling to the room as is synonymous with Shutterly Fabulous plantation shutters. With a new season comes Pantone’s recommended colour of the year. 2013 marks the year for emerald green, described as “a lively, radiant, lush. A colour of elegance and beauty that enhances our sense of well-being, balance, and harmony” – we certainly agree and have used this colour in several of our recent shutter installations. Emerald green, being such a vibrant colour, can be used in junction with other far more animated colours – fuchsia and mauve. However, the Shutterly Fabulous designers wanted a more classically elegant look. By using subtle shades of teal and clean backdrops the focus of the room can really be pulled towards your plantation shutters. With the ever increasing stress of modern day existence, it is absolutely essential to feel calm and relaxed during your resting hours. By using emerald green against a white wall it provides a colour accent creating a stunning, yet calming atmosphere within the room. The renewing feel of emerald green can have a positive impact on every aspect of your life, so Shutterly Fabulous are fully supporting this seasons choice. 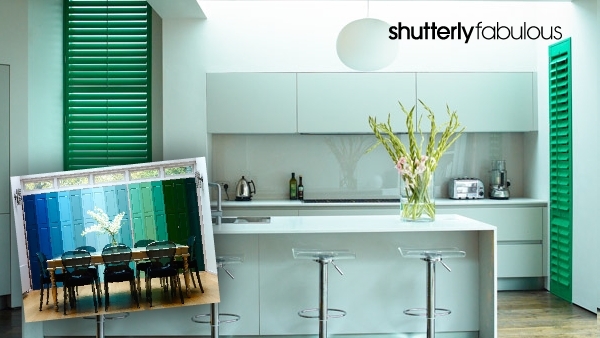 Your shutters are part of what ‘makes your house a home’, so custom colours and designs are available for the full Pantone range. Always feel free to contact us with any other requirements as we will try to accommodate for any request. If you wish to order this colour on your shutters please quote code DULUX TRADE 02GG 21/542.